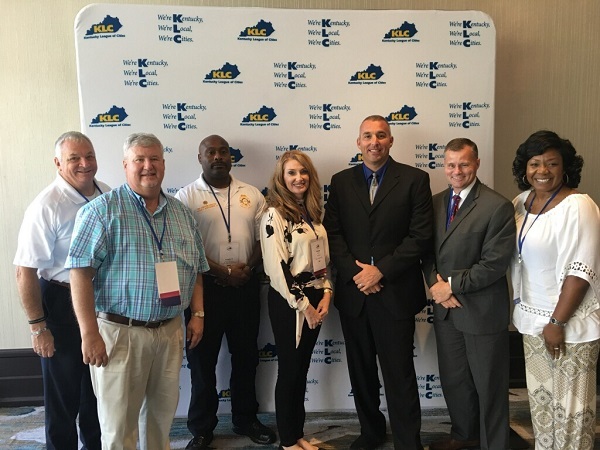 Today at the Kentucky League of Cites (KLC) Annual Awards Luncheon, Mayor Carter Hendricks and Team Hopkinsville proudly celebrated Hopkinsville Police Chief Clayton Sumner being named KLC’s City Employee of the Year. Chief Sumner and the Hopkinsville Police Department will be recognized at the City Council meeting to be held Tuesday, September 25th at 6:00 p.m. The public is welcomed to attend. 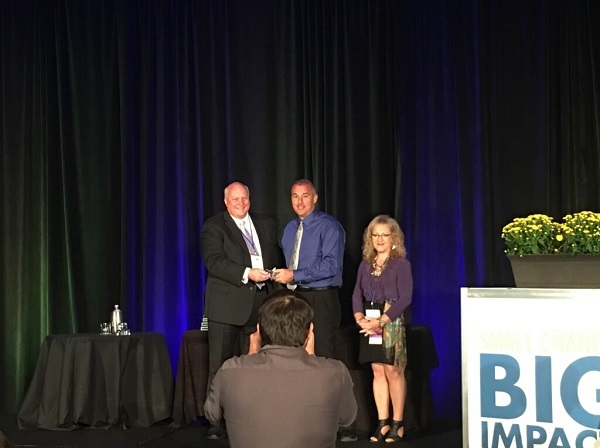 Along with this most special City Employee of the Year distinction, Chief Sumner received statewide recognition among hundreds of his peers at KLC’s annual Conference & Expo. He also secured a $1,000 donation for support of a local program, project, or favorite charity which will benefit the Boys & Girls Club of Hopkinsville-Christian County. The donation was made possible through a sponsorship by the Lexington law firm of Mazanec, Raskin & Ryder. For more information on the award, please call (270) 890-0200. Pictured left to right, Glasgow Police Chief Guy Howie, Chief Financial Officer Robert Martin, Fire Chief Freddie Montgomery, City Clerk Crissy Upton, Chief Sumner, Mayor Hendricks, and Councilmember Kim McCarley. and Mayfield Mayor Teresa Rochetti-Cantrell. This year marks the second time a Hopkinsville public safety employee has won KLC’s City Employee of the Year Award; Fire Chief Freddie Montgomery received the honor in 2015. KLC estimates that there are more than 20,000 city employees throughout the Commonwealth. The award is designed to recognize outstanding Kentucky city employees and celebrate their achievements. Open to any nonelected full-time employee of a KLC-member city, award nominees were judged based on the degree the nominee is recognized as an example of exceptional public service; leadership, professionalism, efficiency, innovation, dedication, creativity and teamwork; representing the city positively; and contributions to improving his or her department and city services.